A couple of weeks ago, I got a message from Robicelli’s Gourmet Market Robicelli’s Gourmet Market requesting that we come try their cupcakes. We get tons of messages about events, products, and restaurants, and while I always appreciate the invitation and offerings, we just can’t get to every one. There was something special about this message from Allison though. 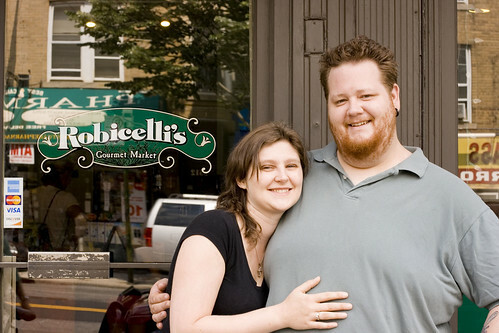 Allison and her husband, Matt, are natives of Bay Ridge, who’ve both spent time working at top restaurants around New York, but ultimately wanted to go home to Bay Ridge and open up a mom and pop shop. While mom and pop shops are disappearing, they took on the challenge, and for that, they deserve all of our support. What Robicelli’s has, is that personal touch that national chains do not have. If you stop in, you’ll likely find Allison and/or Matt working there, where they will spend the time to talk to you about everything and anything they sell. If you want to learn about gourmet food, go there and ask. 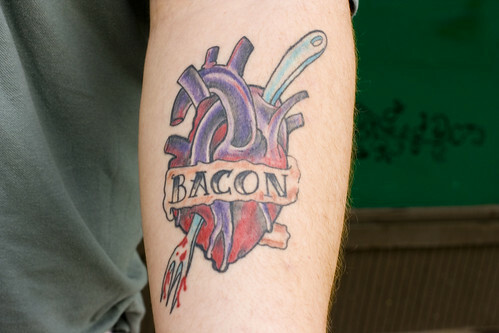 Allison is more talkative but Matt has this tattoo. Enough said. We were invited to try their cupcakes, and that we did. The husband and wife team have a friendly family feud going, about who makes better cupcakes, so try them and tell them which one you like more. We got to try three flavors (they make new flavors weekly) and the winner for us was the Chocolate Turtle: Chocolate Cake with Salted Caramel Buttercream, Candied Pecans & Ganache. Which one of you made these? Can I give you a hug? 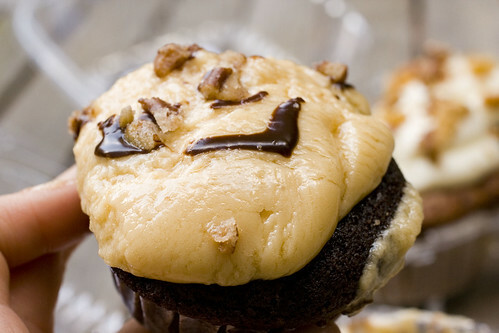 The moist chocolate cake tastes like chocolate, isn’t too sweet, and the Salted Caramel Buttercream is sweet, but has the true flavor of caramelized sugar. It was insanely good, sophisticated, and beautiful before we let it melt (sorry). We also tried the Pecan French Toast (too sweet for us because it’s Maple Custard soaked), and Allison’s Famous Carrot Cake, and a few things become quite evident. 1. The cake portion is moist, which Allison attributes to making small batches. (I’ve complained countless times about dry cupcakes all over NYC.) 2. They do not skimp on good quality ingredients. 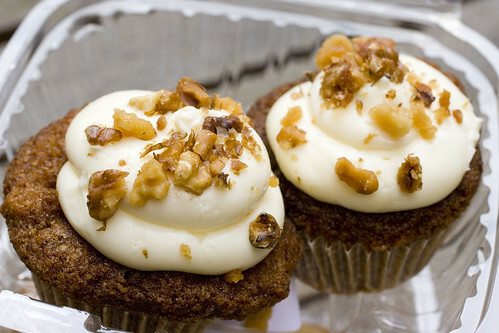 For $2.50 per cupcake, these are the best bang or your buck cupcakes in NYC. They make French Buttercream. They garnish with nuts (when appropriate). You can really taste the flavors! 3. Allison and Matt are talented and creative. Seeing lists of other flavors they’ve done (check out some at Cupcakes Take the Cake), makes me want to go weekly to try their new flavor. If I could just wish upon a star here, I would prefer them less sweet but, that’s me. Go there for cupcakes, but don’t leave without the inside scoop. They’ve been around the block, or all over Bay Ridge, and know where to find lots of other great eats, often at other great places with that same personal touch that’s really missing in Manhattan these days. We got a long list from Allison and tried to eat as much as we could in 4 hours so stay tuned for: brunch at Hom, pizza at Nino’s, Shore Road Bagels and Deli, Leske’s Danish Bakery, and Roll-N-Roaster. So, thanks for inviting us to Bay Ridge. We think it’s a delicious neighborhood and will be back for more. posted by jessica	at 01:23 PM	Filed under Restaurants, Shopping, Take-out/Delivery. You can follow any responses to this entry through the RSS 2.0 feed. Both comments and pings are currently closed. Wow, those look delicious! And $2.50 is a super price for a cupcake, especially such a gourmet one – the bakeries here in Athens, Georgia charge more than that for a standard chocolate one! Thank you so much for coming down, and for the sweet write up (though I could I possibly look worse in that photo! I have never been able to take a decent picture in my entire life). We had a blast meeting you, and are so happy you decided to visit South Brooklyn. 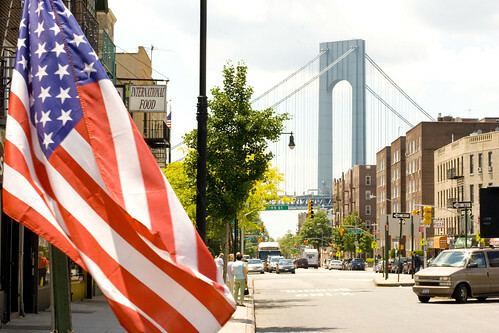 There are so many incredible hidden treasures not only in Bay Ridge, but in Bensonhurst, Sheepshead Bay, Brighton Beach…..just follow the Belt Parkway and you can travel the world. And I’m proud to say that many of these treasures are run by moms and pops just like us. Small businesses are what make this city the greatest place on earth, and in dire need of your support. If anyone is looking to explore the amazing food of South Brooklyn, feel free to email us, and we’ll tell you some of our favorites! Thanks again for coming down- we hope to see you soon, and help you plan your next incredible food adventure! You certainly had a good day!! Brooklyn is on my “places to go” list, looks fabulous, my son’s been & keeps nagging me to go! Lesley, you should definitely visit NY, and make sure to see Brooklyn! If cupcakes aren’t good over there, it sounds like a good opportunity to start a biz. I thought I’d let you know that this morning my husband was letting the ConEd guy into our apartment, who recognized him as “that dude with the bacon tattoo from the internet”. And this is the proudest moment of his life. We want to thank you for helping make it happen. OMG Allison! You made our day!